economists, politicians, and other leaders.Every one of the impressive figures profiled here offers insights that reveal the humanity behind the famous face. Their words—often unguarded, open, and vulnerable—appear exactly as they were spoken, and the dramatic portraits accompanying each interview showcase photography’s brightest talents: Brigitte Lacombe, Bruce Davidson, Peggy Sirota, and Nigel Parry, among others. 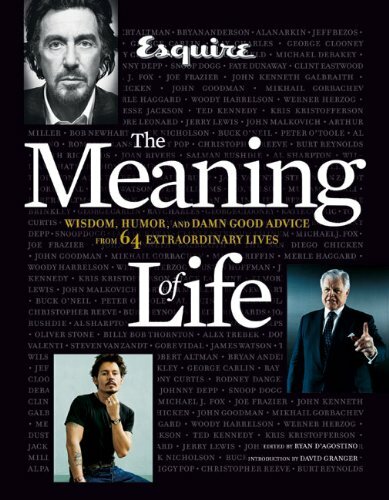 The lessons these larger-than-life personalities convey are funny, inspirational, very down-to-earth—and always captivating.The profiles include:Robert Altman - George Carlin - George Clooney - Tony Curtis - Ray Charles - Johnny Depp - Snoop Dogg - Faye Dunaway - Clint Eastwood - Eminem - Michael J. Fox - Joe Frazier - John Kenneth Galbraith - Mikhail Gorbachev - Woody Harrelson - Dustin Hoffman - Jesse Jackson - Ted Kennedy - Elmore Leonard - Jerry Lewis - Arthur Miller - Keith Richards - Oliver Stone - Gore Vidal - Ted Williams - and many others!